Disney Plush, Jewelry, Sprinter and other Treasures! Spring is coming to New England very slowly this year giving a slow start to garage sale season. Sprinter is spring that is still actually winter. I went to a church sale and found some vintage plush, toys and jewelry as well. There was a toy area where I wasn’t finding much but I started looking at the pile of plush they had and pulled out a few vintage Disney plush. The better sellers are usually the more unusual characters. I found Berloiz who is the gray brother kitten from the Aristocats movie. I’m hoping to get about $30 for him. I also picked up this Samuel J. Gopher who is a secondary character from Winnie the Pooh. I also have him up for about $30. Lady, from Lady and the Tramp is a fairly popular character but this is an older and large version of her so I am hoping that I still may get about $20 for her. Recently I sold a plush of Copper, the hound dog from Disney’s The Fox and the Hound movie for $50 so I was excited to see this plush of Tod, the fox. Unfortunately this small version of Tod may only bring $10. I also picked up a small Mario backpack clip. The plush toys at this sale were only 25 cents. There were several baskets of costume jewelry at this sale. They were all in little ziploc bags and were a little hard to see but the prices were only between $.50 and $2 so I picked up a few of the bags. In one bag there were several horse themed pieces. I think the bracelets in this group were very pretty and I am selling all the pieces in a lot. I also picked up a Minnie Mouse pendant and a gold tone, faux jade and rhinestone bracelet. There were two other pieces that I picked up that I think might be sterling so I am taking them to the jeweler to have them tested. I should really get one of those kits and learn how to do it myself. After I find out more I will share them. Finally I also picked up several pieces of vintage Little Tikes dollhouse furniture. I am hoping to get about $40 for this group. They were mixed up with a big lot of dollhouse items. I picked up a few items at the thrift store this week including this pretty original watercolor. This is my favorite style of painting and I wouldn’t mind keeping this tea pot painting for myself. I also picked up a few artist drawing pencil sets that were hanging in the bags on the wall. Neither of these are very valuable but they may sell for $10 each. Those are the highlights of this week. I heard a rumor that it may warm up at the end of the week but I’ll believe it when I see it! Last weekend there was a synagogue sale near my neighborhood that I attended on Sunday. There was a large rummage area room where a man there looked at all your stuff and gave you a price. I ended up just throwing some small random items into my bag along with the larger items I wanted. Some of the items that I thought were winners turned out to be duds. Some of the items that I thought were duds turned out to be winners. I found a cool plush river otter stuffed animal that I looked up while I was there and he appeared to sell for about $30. When I was photographing him though, I saw that he only had one eye. So he was a dud. 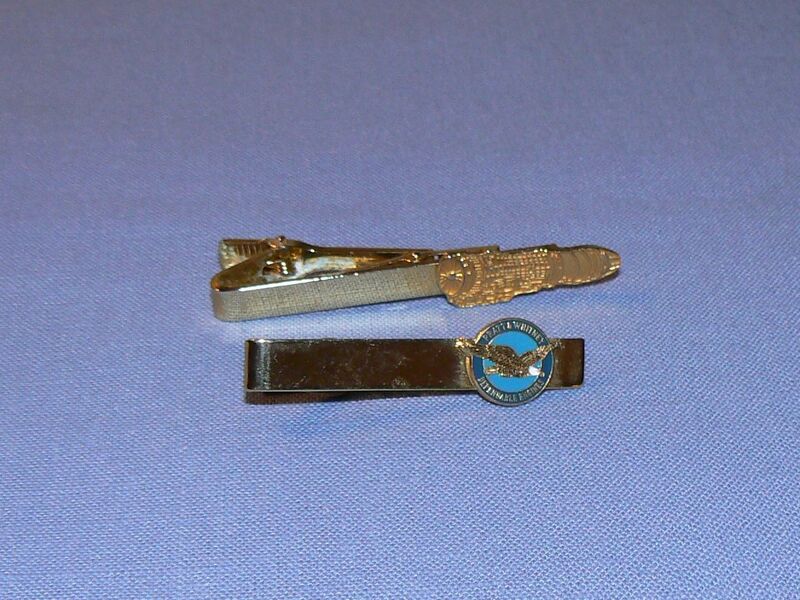 I found an interesting pin in a style that I had never seen before just laying on a table among dishes. I saw a mark on the back that I couldn’t read but I knew it wasn’t 925 for sterling silver. When I got home and used my magnifying glass I saw that it said 800 which I learned is another type of silver. Furthermore I learned that this style of pin is called Pietra Dura and is a type of inlayed stone design. It looks like they can do well so I put mine at auction. 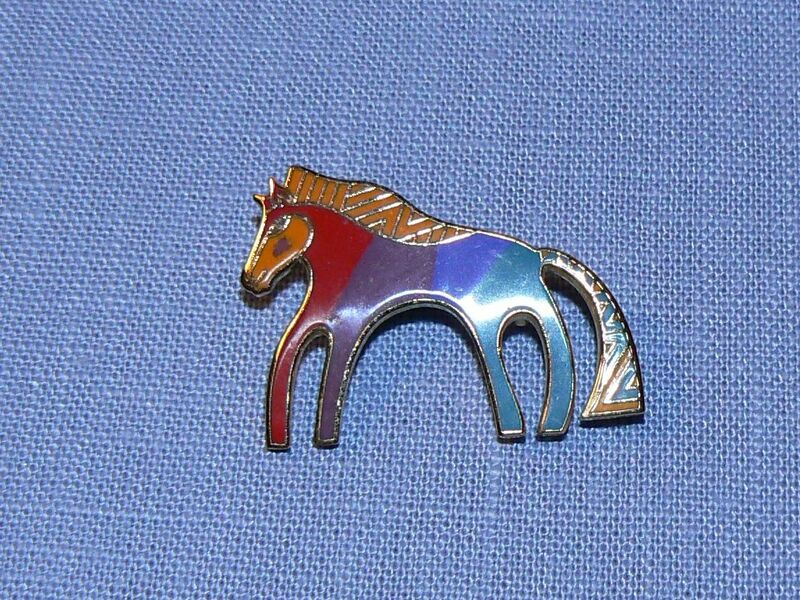 Another piece of jewelry that I found this week at a community wide tag sale is this gold tone pony pin that I think is cute. At the synagogue sale I picked up two bags. One was a military field pack dated 1956. I don’t know what people do with these but I know military items can be popular. This monkey backpack caught my eye. At first I thought he was a stuffed animal. He is from the brand Kipling which is a popular brand for bags. I couldn’t find another like him online so I hope he will do well. This weekend there was a community tag sale about 45 minutes north of me. This was the kind where people host tag sales at their homes. I went to about ten of the sales and found a few good items. I saw this Ray-Ban case at a sale and was happy to see that there were sunglasses inside. When I asked for the price they said $1 so that was great. It took me awhile to research them to find the style. They are called Liteforce. At one sale I saw this pretty wood and brass kaleidoscope. It has two wheels filled with colorful shapes that spin independently to create a million different designs. I love these. It was marked $5 but I think I can get $30 – $40 for it. I’ll enjoy it until it sells. This unusual looking shelf sitter Santa was only $1. He looks a bit like he had too much egg nog. He is marked “Made in Hong Kong”. I love vintage Christmas items and you can usually find them for a reasonable price. At the first house I stopped at the lady there had about 10 boxes of lego sets from vintage to modern. They had no prices on them. She seemed uncertain if they were complete or not so I choose the one I thought looked the most promising and offered $10 and she took it. Maybe I should have bought more but legos are tricky for me especially when a set is used. Her husband had a whole bunch of family military items from jackets to patches to hats. Again none of it was priced and so I just left it. I know some of that can be valuable but I have no knowledge in that area. So that’s about it for this week! Time to get ready for the hopefully big holiday rush of sales!! Some of these finds are from the big church sale from last weekend and some are from sales this weekend. I usually don’t find much jewelry. Often it is priced high and there is a lot of competition for it but at the church sale last week, all the jewelry was in little ziploc bags marked $1. 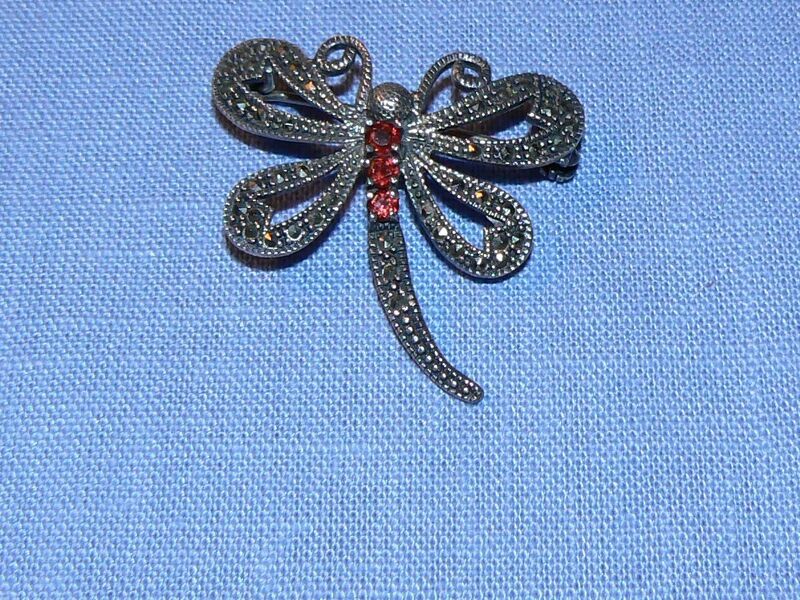 I found a few silver pieces there like this pretty marcasite butterfly pin, marked 925 and this silver and onyx necklace, marked sterling. 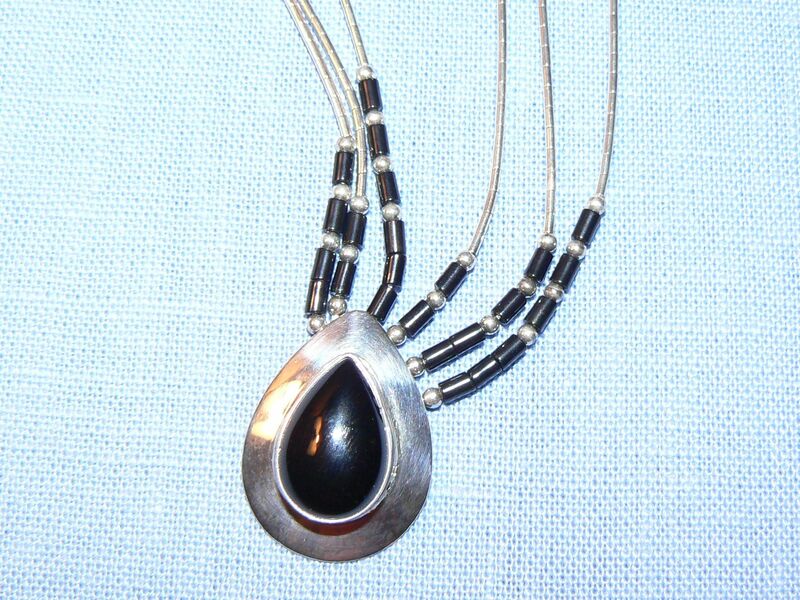 The chain is made of the thin tubular silver beads. I think some people call it liquid silver because it gives the impression of liquid. I also picked up a bag filled with tie tacks and I picked these two out to sell. They are just gold tone. Today I found some jewelry at a fundraising tag sale. 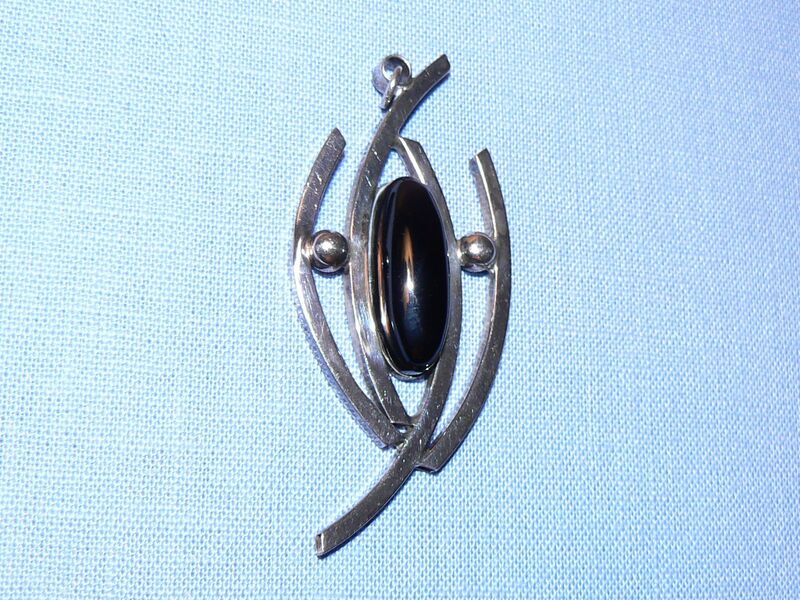 I recognized this pin as Laurel Burch. She usually does cats but her graphic style and colors are pretty distinctive. It’s worth about $10 but I paid a quarter. There was also this interesting looking pendant on the table marked $3. It was signed on the back with the name Aaron Rubinstein and it also said Sterling in script. When I purchased it the lady said “My uncle made this. He made jewelry.” Now, I know a lot of people who make jewelry. My neighbor, my cousin and one of the teachers where I work make jewelry. So when she said this I made some comment like “How nice” or something. But it turns out that her uncle was a popular modernist designer from the 50’s and has a whole store and a website. Had I known that I would have said something like “Wow! Your uncle was Aaron Rubinstein! How cool!” In which case she would probably have charged me a lot more for the pendant because it turns out that it may sell for at least $100. 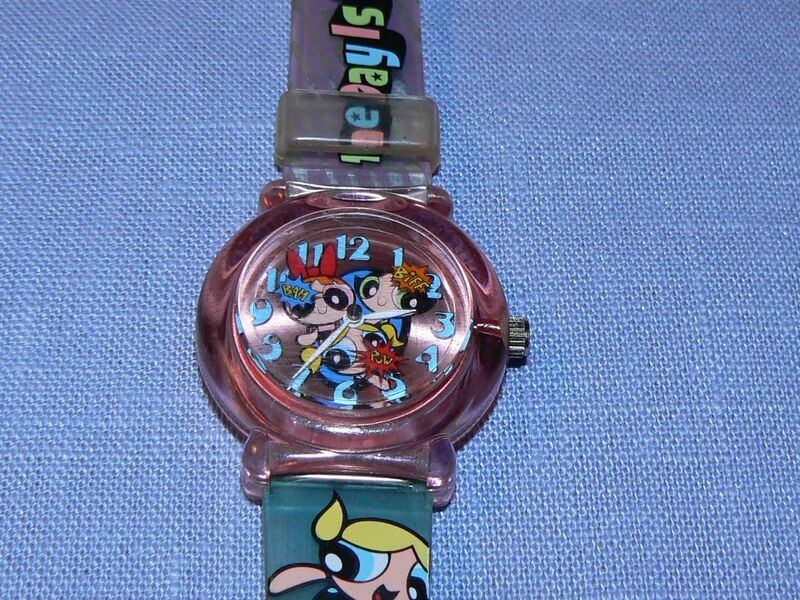 Another jewelry find was this Powerpuff Girl watch. I had to replace the battery which cost $10 and I think it will only sell for $20 so there’s not too much profit but I think it’s cute. I only found a few toys this weekend. 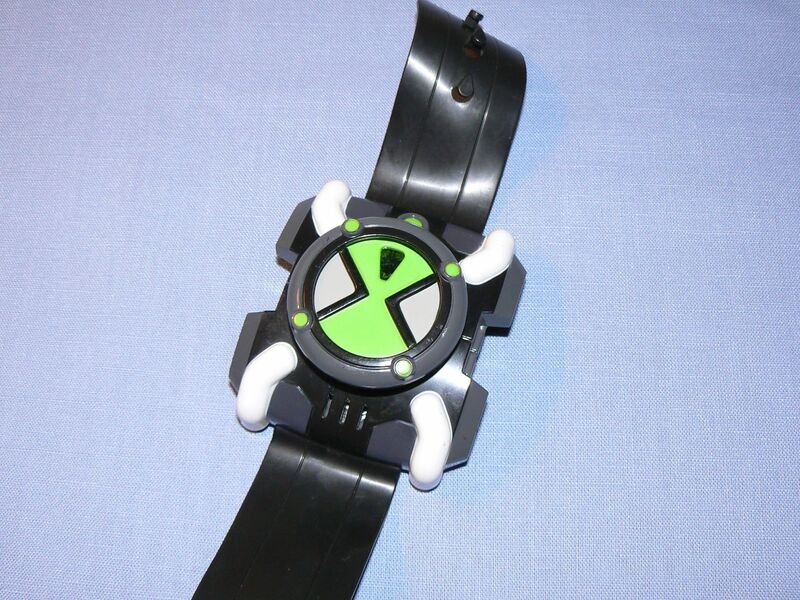 One was this Ben 10 FX omnitrix. It looks kind of like a watch and has something to do with aliens. It lights up and makes noise. The one you want to look for is the one with the white corners. These can sell for between $40 and $50. I had to buy a battery for it though, which cost me another $10. 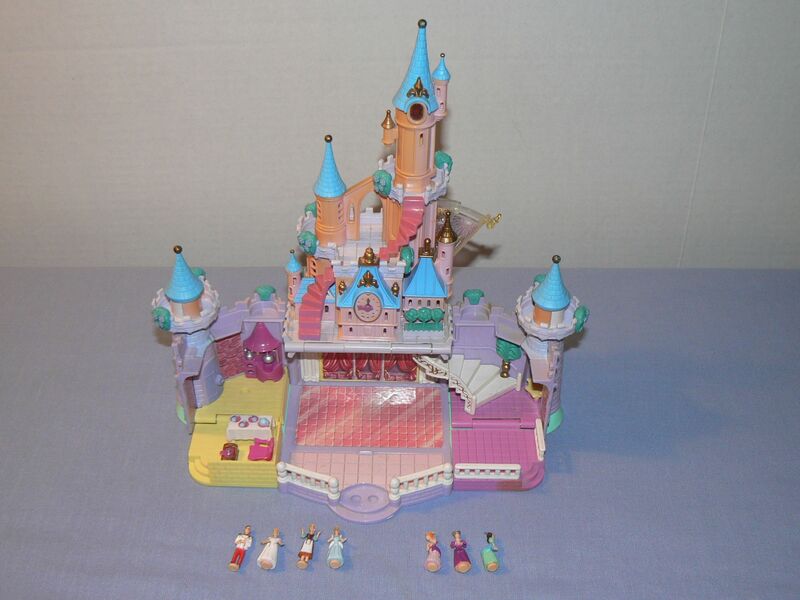 The other toy I found was this Polly Pocket Cinderella’s castle. The thing about some of the Polly Pockets is that what gives them value is having the little characters that go with them. When I bought it I didn’t see any characters inside the castle but when I got it home I realized that there is a hidden draw in the back. 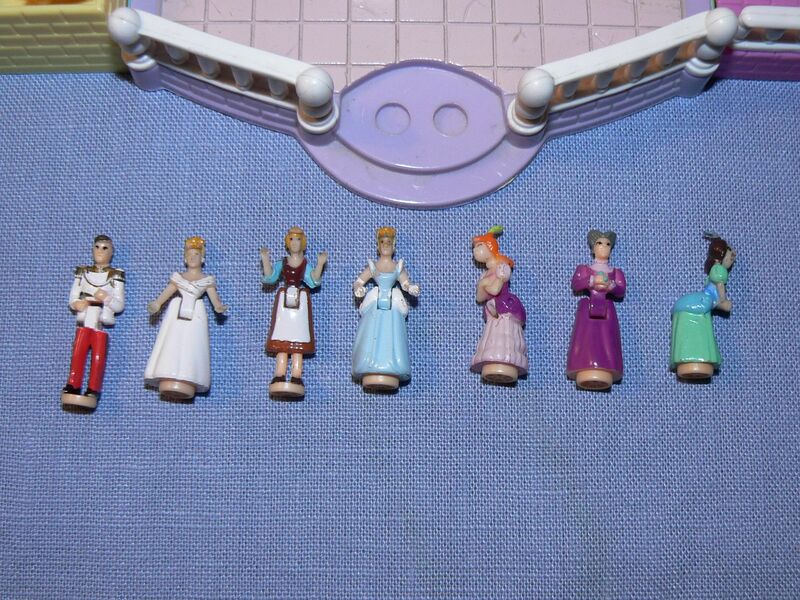 I was happy to find 7 tiny Cinderella characters inside! 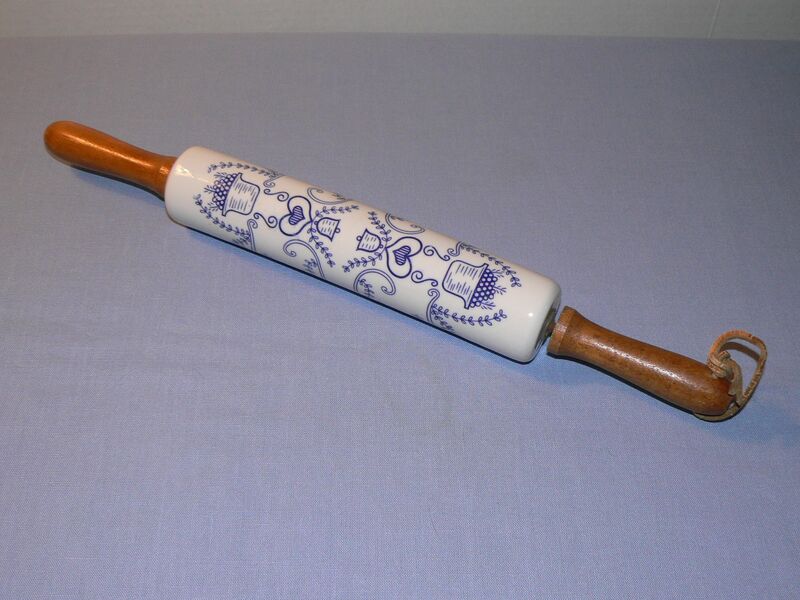 The last find of the weekend was this blue and white ceramic rolling pin which I think is very charming. 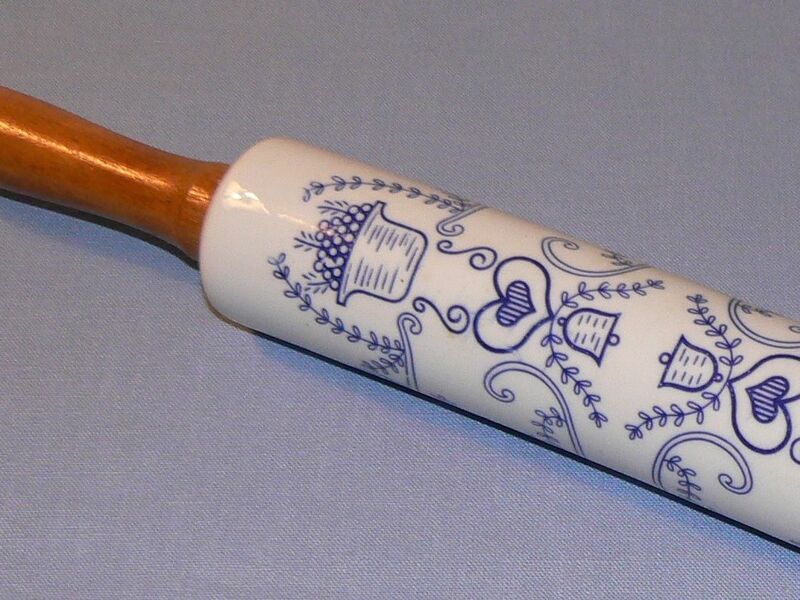 I love the combination of blue and white on ceramic items. On the down side, the Michael Kors bag I picked up at last weeks sale is a fake. I also picked up a Barbie doll this weekend that I thought was a vintage Francie doll from 1966. After I researched her I realized that she is a reproduction doll from the 90’s. She has 1966 stamped on two places on her! That’s confusing! But all in all I’m very happy with my finds. Tomorrow it is back to work for me after a summer off. I’ll look forward to fun fall tag sales!